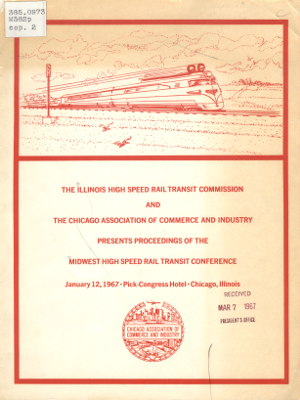 On January 12, 1967, the Chicago Association of Commerce and Industry (now the Chicagoland Chamber of Commerce) and the Illinois High Speed Rail Transit Commission hosted the Midwest High Speed Rail Transit Conference in Chicago's Congress Hotel. By contemporary standards, this conference might more accurately be described as a mini-conference: 11 speakers in two panels on a single day along with seven industry exhibits. Six of the speakers were industry representatives, two were academics and the conference's closing dinner featured the only elected political leader, U.S. Representative Henry Reuss. This conference is not of particular historic importance, nor did it directly lead to the construction of any high-speed lines. But the conference offers an interesting point of comparison to see how remarkably consistent the discourse over American intercity passenger rail transportation has been despite significant technical, social and political change. Indeed, large portions of the proceedings could be delivered a half-century later with only minor modifications of names and places. These eerie echoes in history beg the question of whether today's proposals are destined to meet the same fate as that of their direct historical antecedents. The one major contemporary element missing from the 1967 Conference is the question of energy efficiency. In 1967, a barrel of Illinois Basin Crude cost around $3.15, which is roughly equivalent to $20.50 in 2010 dollars, based on the CPI (IOGA, 2011; BLS, 2011). During the 2008 peak, petroleum traded around $137 a barrel. Although the ensuing economic meltdown brought prices back down to the mid $30's by the end of the year, increased economic activity and Middle East tension brought a return to triple-digit prices in 2011 that may become the norm rather than the exception for the future (EIA, 2008a, 2008b, 2011). M. King Hubbert's (1956) paper predicting a peak in American petroleum production was about to come true around 1970 and the Arab oil embargoes of the 1970s would spur another generation of HSR planning, but 1967 was still an era of plenty as far as energy was concerned. Whether high-speed or higher-speed rail is the appropriate American adaptation to a world of more expensive and constrained resources is still an open question. In the wake of the 2010 elections and ascent of virulently individualistic, pro-auto political forces, is seems unlikely that a robust, national intercity passenger rail network will become a reality any time soon. But for proponents of intercity passenger rail, the resource issue may be the one argument that distinguishes our current time from earlier eras, and the most effective defense for the massive public investment that will be needed to transform American intercity transportation to meet the mobility needs of future generations. A full version of this viewpoint was published in The Journal of Transport Geography.